Thousands of Illinois youth who have worked to improve their community packed Allstate Arena in Rosemont on Wednesday to enjoy the WE Day Concert. ROSEMONT, Ill. (WLS) -- Thousands of Illinois youth who have worked to improve their community packed Allstate Arena in Rosemont on Wednesday to enjoy the WE Day Concert. The concert is a reward for students who have volunteered in their community and taken action on social issues. The Chicago area event was among several in the U.S., Canada, the Caribbean and United Kingdom. On Wednesday, nearly 15,000 students and educators from 500 schools attended the event, which will feature speakers from entertainment, politics and business backgrounds, as well as music performances. Thousands of Illinois kids learned about the power of community service on a local and global scale at the annual WE Day celebration. "It definitely opened my mind up a little bit. I understand more. I feel like I can make a change in the world," said student Alieah Villariny. "It was like life changing. I really realized just how a little tiny thing can really change the world," said student Genevieve Healy. ABC7's Cheryl Burton and Will Jones were among the speakers on stage, along with musician Jordan Fisher; Anthony Gonzalez, the voice of Miguel in Pixar's "Coco;" and the daughter of boxing great Muhammad Ali, Rasheda Ali, who grew up in Chicago. Rasheda Ali, daughter of Muhammad Ali, was one of the speakers at WE Day at Allstate Arena in Rosemont. "I want them to realize that we are living in a racially divided country now and my dad always included people. He believed in inclusion," said Ali. Gonzalez said he wanted to encourage young people to stay involved in their communities. "This is very important. It's our future. I just want every kid out there to do something positive in life," he said. Many students said they left the arena with a stronger belief in their own power. "I think my generation and the generation coming up will make a change," said student Stephanie Zaragoza. 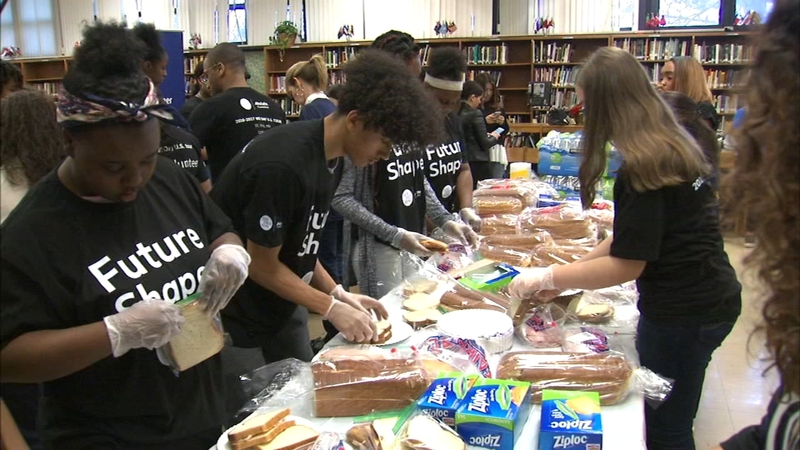 On Tuesday, about 700 schools across Illinois took part in the Allstate Foundation's WE Volunteer Now campaign on Tuesday. A celebration of kids from across Illinois committed to giving back to their communities. WE Day is back once again with a big show set for tomorrow at the Allstate Area. Hundreds of Illinois youth who have worked to improve their community packed Allstate Arena in Rosemont on Wednesday to enjoy the WE Day Concert.